Radio in the early 1950s usually meant stations relied heavily on network programming, doing a minimum of local programming, mostly news. Under the ownership of the Silver Brothers and Sam Camaan, WFEA felt intense competition from Manchester's other radio stations: WMUR (ABC Blue) and WKBR (independent). By mid 1952 it was clear the FCC intended Manchester to have just one VHF television channel. N.H. Broadcasting Inc. applied for the license for Channel 9, but so did WMUR, WKBR and the Union Leader newspaper. Television was already starting to draw the bigger radio stars. 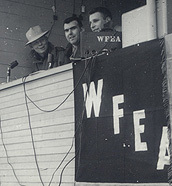 For example, WFEA carried the CBS Radio and TV simulcast of Arthur Godfrey's Talent Scouts. While WFEA had some local deejay programs like the 1370 Streamliner and Dance Time, it relied increasingly on local personalities who played recorded music. 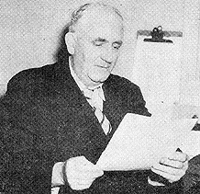 In mid 1952 the Silver Brothers transferred Manchester native Donn Tibbetts from their station in Concord, WKXL, to host WFEA's wakeup show. Since 1949 Donn had been making a name for himself in the music industry, serving as regional administrator of the American Society of Disc Jockeys. 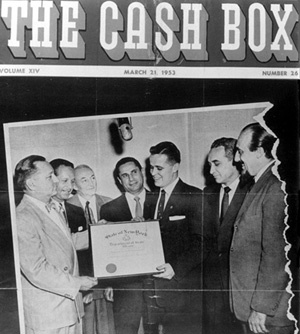 The photo at right shows him receiving the organization's charter from (l-r:) ASDJ founder George Goodwin, Fred Mann of RCA Victor, Charles Wynn, MGM's artist and repertoire man Harry Meyerson, Decca's Jimmy Hilliard and Mitch Miller. On August 27, 1953, the FCC awarded former Governor Francis P. Murphy the license for TV channel 9. Murphy announced he would also purchase WFEA for $175,000. Murphy owned WMUR Radio in Manchester and since he couldn't own two stations in the same city, he planned to search for a new buyer. The agreement stipulated that Morris and Henry Silver, and Sam Camaan, couldn't buy any other New Hampshire radio property for five years, though they were allowed to keep WKXL in Concord (which they sold the following March). In February 1954, $100,000 changed hands and the keys to WFEA were handed to Public Information, Inc., which owned stations in Pennsylvania and West Virginia. N.J. Rahall and his four sons, J. Joe, Sam G., Dean F., and Farris E. made up the family-owned company. The series of management changes left WFEA heading toward the latter half of the 1950s with neither an FM or TV sister station. Another significant development in 1954 was the construction of an addition at the Merrimack transmitter site. Studios were moved out of downtown Manchester and remained there during WFEA's Top 40 era. WFEA made the news on April 24, 1956. 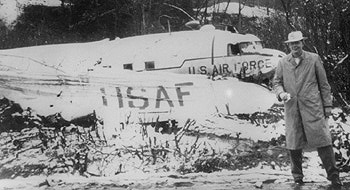 News director Palmer Payne was aboard an Air Force C-47 that crashed on takeoff from Grenier Field in Manchester during a snow storm. He was among a delegation of Manchester citizens heading to Fort Knox in Kentucky on an inspection tour. 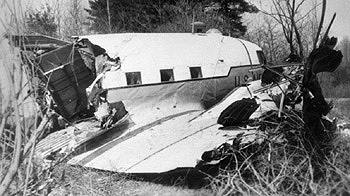 Payne was speaking into a portable tape recorder when the wings clipped the fire station and the transport plunged down a ravine. No one was killed as the plane split in two, but there were several injuries. Riding with Payne were WGIR's Bill Perry and WKBR's Larry O'Toole. December 28, l956 marked a sad day for WFEA listeners. The Old Crusader (left) did his final show concluding a 15-year career in Manchester. But the spry 71-year-old didn't retire; George Christie relocated to WSTP, the Rahall station in St. Petersburg, Florida. His career began at WQAM in Miami in 1927! 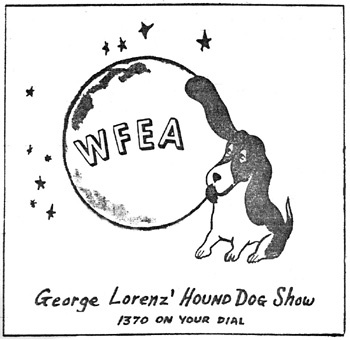 A major landmark for WFEA took place April 15, 1957 when the station dropped all network programming and began playing pop music from 6:00AM to midnight. It bought newspaper ads proclaiming Independence Day. Len Libman hosted morning drive and Palmer Payne did news...Julie Blake hosted Kitchen Chat every morning at 9:15...Gene and Julie LaVerne hosted the midday show...Chris Nakitas hosted Open Mike weeknights...and Chuck O'Neil spun the hottest records of the day on the Chuck Wagon Show weeknights at 7:15PM. 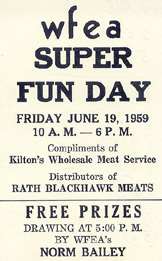 WFEA took a shot at crosstown competitor WKBR in May 1958, by hiring their former morning star, Norm Bailey. The previous spring Bailey had tried to jump ship for WGIR but WKBR went to court and won an injunction enforcing a one-year non-compete clause. After sitting out the year, Bailey began hosting WFEA's wakeup show. WFEA finished the decade with a new owner. 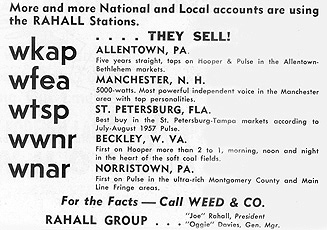 In March 1959, the Rahall company sold the station for $275,000 to William F. Malo and Frank E. Pellegrin's WFEA Broadcasting Corp. They continued WFEA's local pop music music format in a revolutionary way. Just after Labor Day they imported Buffalo broadcasting legend George Lorenz. Each weeknight The Hound's hip rhyming rap, and the hottest wax, scorched WFEA's airwaves via tape recording. What's a deejay to do? WFEA's Ronn Allard found out the pros and cons of getting a free haircut live on the air - from an engineer!